On islands, imported plants and animals can spell ecological disaster. The Aleutians, the Galápagos, the Falklands, Hawaii, and countless other archipelagoes have seen species such as rats, goats, brown tree snakes, and exotic grasses delivered by human visitors. Many of the newcomers have flourished to the point of driving unique island species extinct. People are now trying to reverse the damage of these ill-advised translocations. Step one is obvious: eradicate the invaders. Step two, however, isn’t so clear. Experts argue over whether expensive, time-consuming, and labor-intensive restoration is necessary, or if simply removing non-natives is enough. Now a study set in California’s Channel Islands indicates eradication alone can jumpstart recovery. Led by two UC Santa Cruz undergraduates, the research shows native shrubs reclaiming the island on their own nearly three decades after removal of sheep and other grazers. The study is published in the journal Restoration Ecology. “Taking out those sheep triggered a large change in the vegetation; it was going from grassland back to coyote brush or California sage, to a more diverse community,” said Nissa Kreidler, one of the study’s student authors. “People spend millions of dollars on restoring island ecosystems. So it’s a huge finding that passive recovery can be sufficient and under certain circumstances, active restoration is sometimes not necessary,” said Roxanne Beltran, the paper’s lead author. The paper grew out of an assignment in the Conservation and Ecology in Practice “supercourse” both students took in spring 2012. Taught primarily by UCSC professors Don Croll (ecology and evolutionary biology) and Erika Zavaleta (environmental studies), and UCSC Natural Reserve System director Gage Dayton, the class spends the entire quarter learning techniques for ecological and conservation research while visiting the protected wildlands of the UC Natural Reserve System. Students read previous research pertaining to local ecology and management, then design and conduct their own short-term field studies. 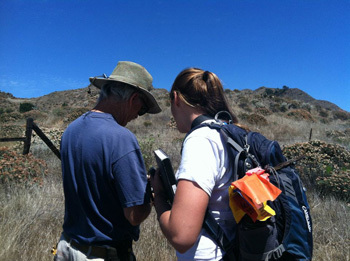 On Santa Cruz Island Reserve, humans have had a major impact on land conditions. The first sheep arrived 150 years ago, to be joined by cattle, horses, and feral pigs. 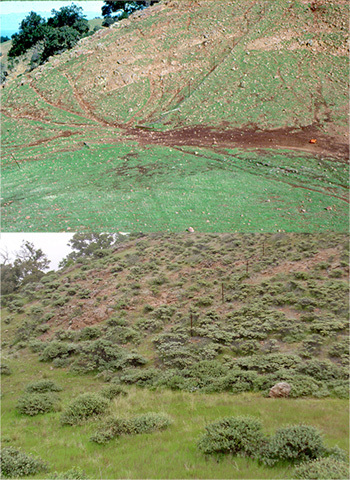 These large herbivores completely denuded some areas, and transformed others into non-native grassland. The effort to eradicate sheep, cattle, and horses from the island began in 1981 and was largely complete by 1999; feral pigs were eliminated by 2007. Then the land was left alone. 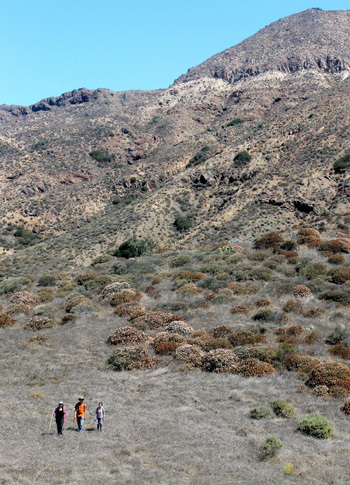 At nearly 100 square miles in size, Santa Cruz Island is far too large to actively replant native vegetation. Initially, removing grazers caused unforeseen consequences. Ten years on, non-native grasses had taken over a larger share of the island. Dirk Van Vuren, now an ecology professor at UC Davis, documented that initial shift in the late 1980s and again in the 1990s. He compared the plants on either side of a sheep exclusion fence using photos and vegetation transects. The results were so promising that Beltran and Kreidler decided to develop them into a publishable paper. That research confidence did not arrive by accident; it’s what the supercourse was designed to do. “We have them do study after study; when they’re done with the quarter they’ve finished five, one on each reserve they’ve visited. They are constantly writing up their work and getting more efficient at study design and data collection. It takes the mystery out of doing research, and they’re not afraid to try things and make mistakes,” instructor Croll said. 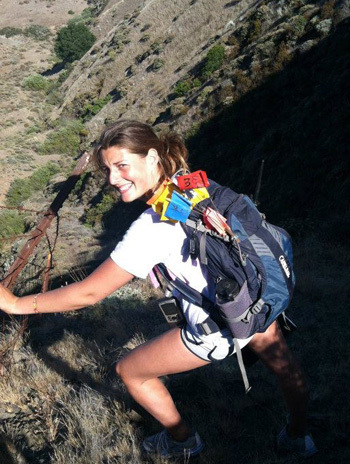 For her part, Beltran saw a chance to join the scientific community. “I had done a lot of learning and practicing to be a scientist through lessons and assignments. But Gage, Don, and Erika made it really clear that we all had the capability to take the next step, to do research on our own, and to make contributions in our field. They wanted us to find an important question that had implications other people would be interested in,” Beltran said. The students started by contacting Dirk Van Vuren, the author of the earlier study. He shared topographic maps of his photo and vegetation transect locations as well as the historic photos themselves. The students and their fellow supercourse participants, Mickie Tang, Zoe Wedel, and Jared Anderson-Huxley, set out for the island that summer to update Van Vuren’s study. They received research funding from UC Santa Cruz through the Department of Ecology and Evolutionary Biology, the STEM Diversity Program, and the UCSC Natural Reserve System. Their week and a half on the island proved unexpectedly rocky. While the students had translated Van Vuren’s map locations into GPS coordinates, they hadn’t counted on how difficult it would be to reach each site. “We could see the places we needed to go in Google Earth, and the route to each site looked fine from satellite images. But one was in a huge ditch, another on top of the mountain, and we didn’t realize how crazy the roads were,” Beltran said. Reserve manager Lyndal Laughrin volunteered to drive the team around, allowing them to sidestep a rugged trek up 2,800-foot Diablo Peak. “He saved us,” Beltran said. Even so, scrambling down cliffs and ducking around the barbed-wire sheep fence left the students scraped and bloody. Back in Santa Cruz, the students compared photos shot from the same island vantage points in the early 1980s, late 1990s, and 2012. They found large areas once occupied by grasses replaced by woody shrubs, a shift that nearly doubles the amount of carbon stored on the island. Places grazed down to bare soil were being recolonized by plants, reducing soil erosion. The vegetation transects told a similar story. The land area covered by grasses dropped by half, with native coastal sage scrub making equivalent gains. Aerial surveys and vegetation maps of the island from The Nature Conservancy, which manages the land, provided additional evidence of these changes. Both students say they gained a great deal from writing the paper. “It’s very different than writing a paper you think your teachers would like. I developed a new appreciation for what it takes to be a scientist,” Kreidler said. Kreidler graduated from UCSC in 2012. She has gone on to run Save The Bay’s volunteer-based restoration program. While replanting San Francisco Bay shorelines with native plants, she talks with thousands of local residents about issues such as pollution and climate change in the region. Kreidler plans to go to graduate school to study conservation. For her part, Beltran started volunteering at the NRS’s Año Nuevo Island Reserve working on elephant seals alongside Dan Costa, professor of ecology and evolutionary biology at UCSC. She discovered her passion was marine mammals and, after graduating in 2013, landed a coveted spot in graduate school at the University of Alaska. She now conducts her doctoral research on the world’s southernmost mammal, the Weddell seal. “It has been my dream to go to Antarctica since I can remember. One reason I worked so hard as an undergraduate was to realize that goal,” Beltran said. Now she flies to McMurdo Station twice a year, where she gets to see curious penguins waddling around her equipment and minke whales spyhopping on her from water holes in the ice.